To specify custom fit function formula, press Add button and select Custom Equation in popup menu. Enter your formula in y(x)= text field below. 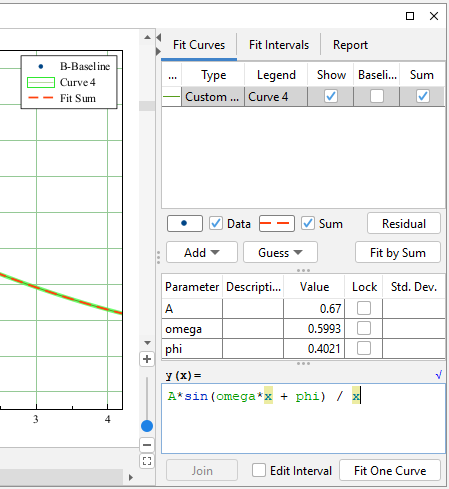 Use x as fit function argument. See formula syntax for details. You may recall last entered custom fit functions using Recently Used Custom item in Add popup menu. Parameters names are case-sensitive (a and A are different parameters). Parameters names lengths are not limited. Begin names with letter or _ sign. You can use numbers in the middle or in the end of the name: a1, a_1, A1, a1t, but the names like 1a are not allowed. The parameters you introduce in formula will automatically and immediately occur in parameters list, you do not need to enter parameters names in the list manually. Random values are used as the initial values of parameters. Do not forget to set more relevant initial values, otherwise fit algorithm may fail. You can adjust Parameters in table using mouse wheel scrolling when mouse cursor is on the desired parameter: Hold Ctrl key (Cmd key on Mac) and scroll. If Shift key is also pressed the parameter step for one wheel 'click' will be increased.